It's been a historical week around here, as far as schooling goes. Amber completed every single lesson scheduled! Some weeks I know in advance will have numerous appointments and I don't even schedule lessons. We just do what there is time to complete when there is time. That method does make Amber anxious though. She has always needed to know what was coming up next and it drives her bonkers to not be able to see lessons planned. Normally, I plan the lessons I think are reasonable based on our appointments for the week. Sometimes Amber is able to finish one or two days of lessons as scheduled, but other days have subjects pushed off day after day until they are rescheduled for the next week. Trying more new fructose foods this week: a mini-milk shake at Outback - it was a surprise success, but it was the only fructose that day. Her first bite of watermelon in 2 years - in very modest amounts with no other questionable foods it has been a success. Jelly for the first time in 2 years - failure the first day. 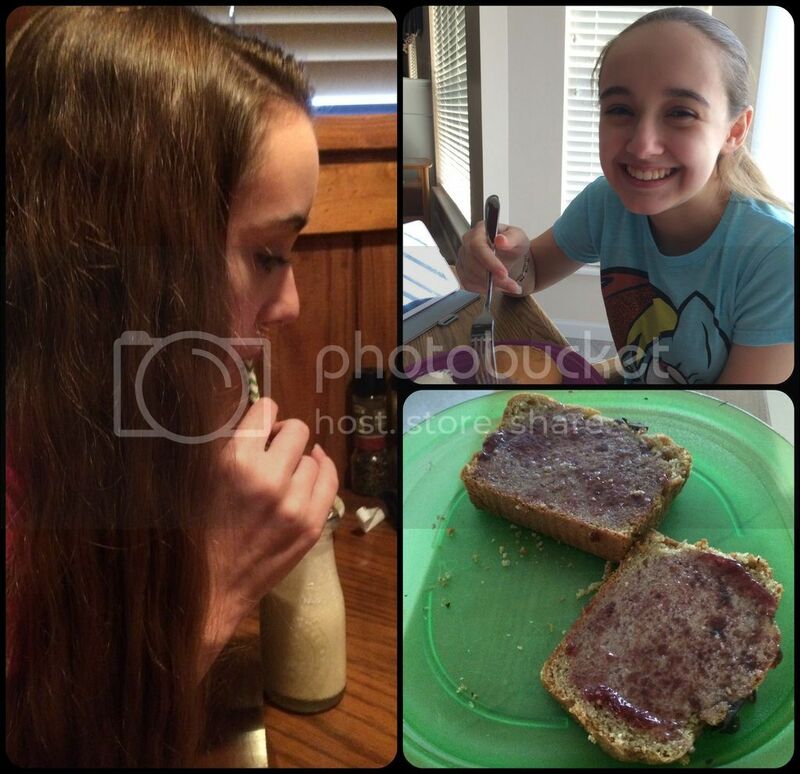 One slice of bread & jelly with no other fructose foods for at least 6 hours, has been a success. This week Amber completed every single assignment on the day it was assigned! This was despite a very rough Friday evening at the teen group outing and being sick /recovering all weekend long. After a busy Monday and Tuesday plus a nearly sleepless night for me on Tuesday, I declared Wednesday a free day if Amber desired. Amber had her flute lesson and the first week of Confirmation later in the day Wednesday, so I wanted her well rested after our very busy days. Instead, Amber got up at a reasonable time, did her therapy assigned stretches without being reminded, and showered. 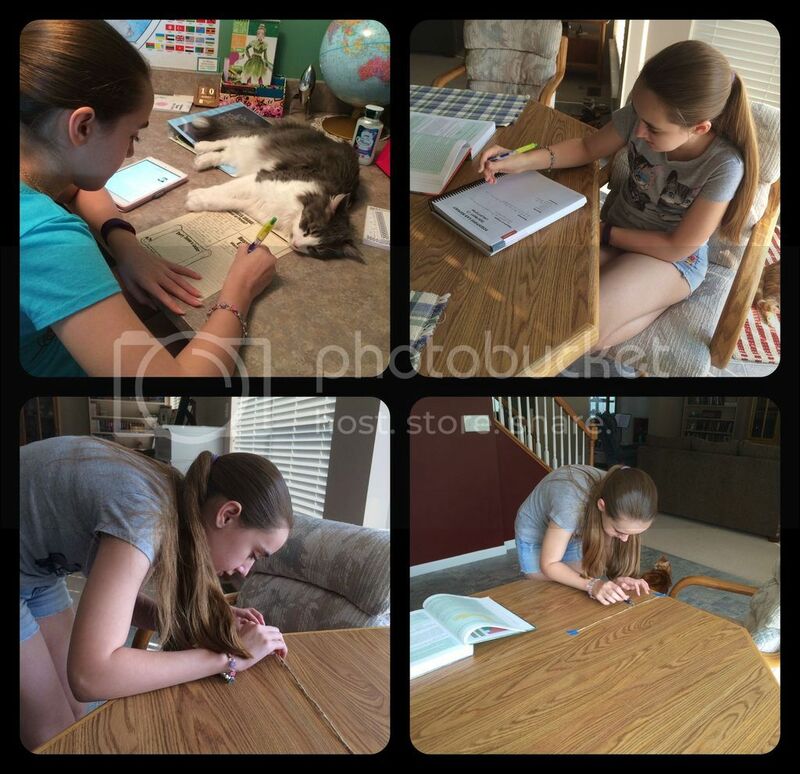 I then found her working on school assignments as scheduled in Homeschool Tracker Online. 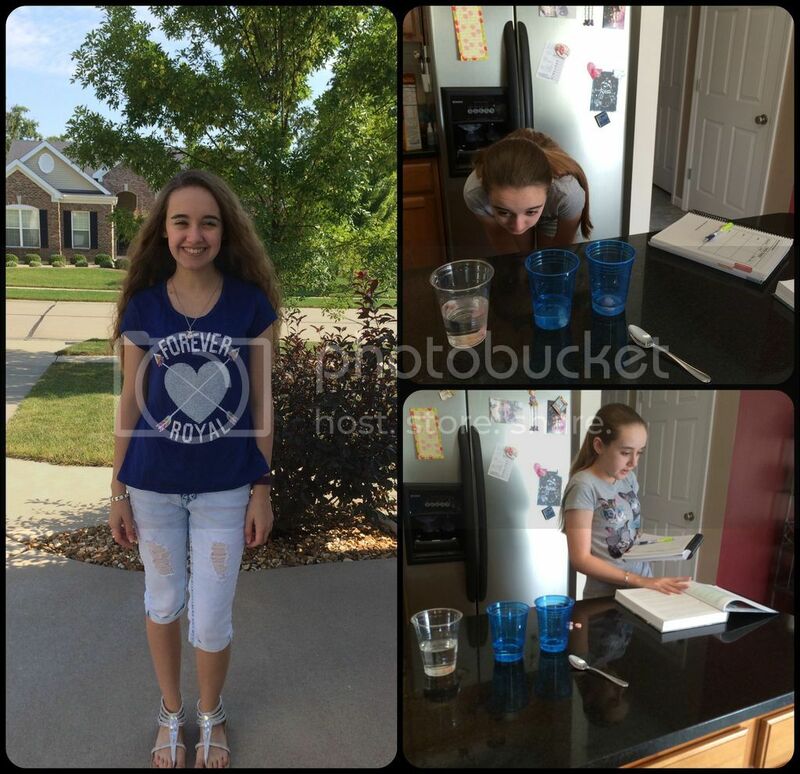 Even today, Amber took school work with her to my doctor office visit and subsequent testing. Another fun week of co-op. She really liked this outfit and wanted her picture taken again. Plus a science experiment. I am letting her run the experiments this year, with me there as an assistant. Amber is definitely worn out and in need of a weekend rest, however she has made remarkable progress in accepting and dealing with her chronic illness. She normally has a fairly positive attitude, except can be easily defeated in her school work. We've been working on learning when to push through tiredness and when to call it done. Because of all of the lessons completed this week, Amber is finally ready to start poetry next week. We are alternating between literature novels and poetry in our literature studies this year. Amber adores poetry, however due to a review item we needed to start with a couple of novels first. I'm hoping poetry helps to encourage diligent work again next week. We also officially ended our explorers study in history and are ready to move on with our normal Tapestry of Grace lessons. Again this year we are supplementing them with the Home School in the Woods Time Travelers series. Hopefully, Amber finds interest again in doing a few history projects. Over the summer she was pretty burned out on projects, preferring to read, write, and work on timelines. (top-left) School work, when she wasn't required! Plus another Amber run science experiment. Monday, Amber did have her first physical therapy appointment to work on supporting her loose joints as a result of her Ehlers Danlos. Most of the session was spent evaluating Amber, taking measurements, and talking about the future plan. Amber's joints do not follow a pattern in their flexibility, so the therapist will have to map out everything before designing the entire therapy course. The therapist was able to give us a few daily exercises to help strengthen Amber's shoulders. Over time Amber will work on all the joints, but is beginning with the troublesome areas. The goal is to teach her exercises to use indefinitely at home, however it will take several months of weekly therapy to get through every joint needing assistance. (top-left) Waiting for therapy - she was having a fructose reaction, so didn't want her dark eye rings showing. 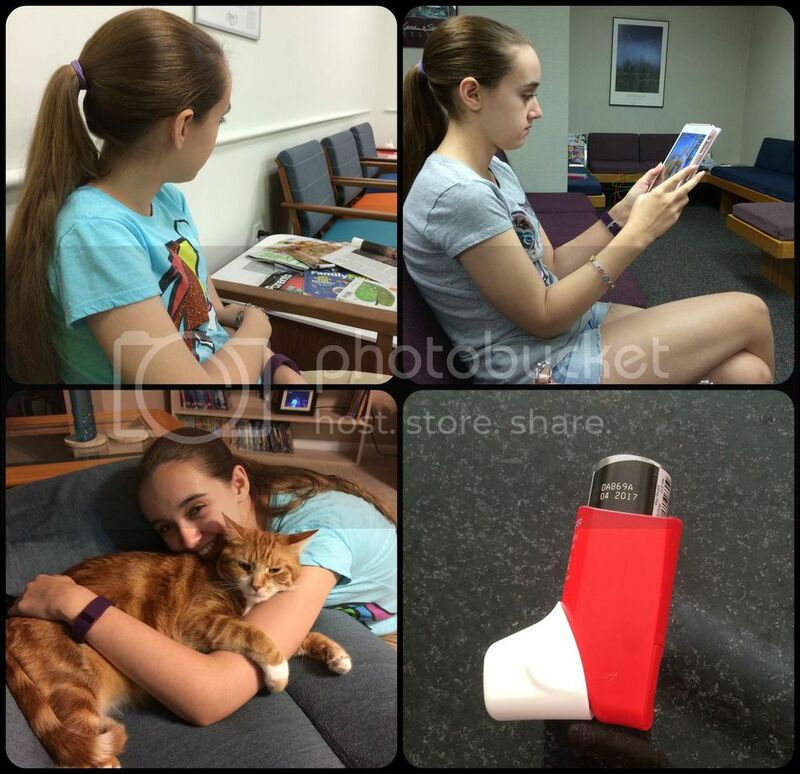 (top-right) Waiting at the allergist - no problems, just regular checkup. (bottom) Kitty therapy makes it all better. And my rescue inhaler. Ugh. I've struggled this week with exhaustion and breathing problems after the teen outing last Friday. While chaperoning the group I had another episode with my breathing, which convinced me to visit the doctor this morning. Today, I've already had an EKG and chest x-ray to rule out the more unlikely causes. The EKG was normal as well as the x-ray, thankfully. It looks like I've had undiagnosed exercise induced asthma for several years, but I still need a pulmonary function test to verify. The worst episode occurred last Friday during the outing, and I've had a little difficulty breathing this entire week since the episode. It's also been horribly hot and humid here, which hasn't helped. I've already picked up my rescue inhaler in case it happens again before seeing a pulmonary specialist. Overall it's been a great week with just a few hiccups and we're ready for the long Labor Day weekend. I remember Philip being on fluids only after bowel surgery, finding a lone carrot in the bottom of his strained veggie soup. He happily scarfed it down. I can imagine Amber was overjoyed to have some long banned foods. I am sorry to hear that you need a rescue inhaler. I will add you to our prayers. I'm sure Philip did scarf down that carrot. It was the forbidden food! Amber had some food reactions on Friday, so we are backing off of the new foods for a few days to let her body adjust. Too many reactions in one week. I am sorry you are having breathing problems. Our son Tim has lots of trouble with asthma and has described many times how it feels. Our prayers are with you. Good job to Amber!!! She really stuck with it and enjoyed relative good health. That is a cause for celebration. Have a restful weekend. Thanks! We decorated for Fall today and even bought a few new decorations to refresh the look. Amber says Winter is her favorite season, but I really think it is Autumn. She gets excited over Christmas and her birthday in Winter, but she loves everything about Autumn. Today was her reward for such a good week. We decorated a little earlier than normal. Christy, I just keep thinking what a blessing that you homeschool... imagine what life would be like if Amber were in school? Miserable, I am sure. I'm praying for YOU to feel better, too. Have a restful weekend! Thanks, Mary. I'm doing a little better since I wasn't outside as much today. I probably should have gone to the doctor years ago when I noticed I couldn't run and breathe at the same time. LOL. So glad Amber is finding some balance with her illness and even taking on some challenges. She is a real trooper!! Congrats to her on a completed week of school work! I know she must be so proud of herself. Hooray for an awesome week for Amber! I'm sure she enjoyed trying out some new foods! Sorry about your breathing issues though. I am glad your tests didn't indicate anything serious.